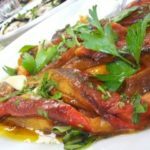 Roasted pepper salad: There are many appitizer dishes that are quintessentially Italian and roasted pepper salad is one of them. 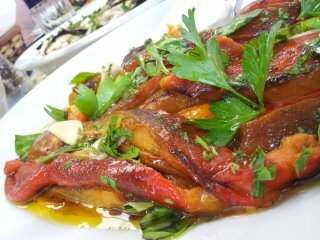 However, roasted peppers are also served as a ‘contorno’ or vegetable served alongside a meat dish. In 1904, Antonio Mancini was 20 years old. With a few things and a lot of will to work, he left Italy for America. 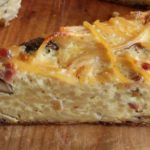 He settled in New Britain, Connecticut, with his wife and opened a small grocery Italian that eventually grew up and and ‘become a small chain of three stores. On the second floor of one of his stores, Antonio began to roast and eat sweet peppers that reminded him of his childhood. His Roasted Sweet Peppers quickly became popular with his friends and neighbors and in 1940, Antonio had to look for a bigger venue for their production. He found it in Florida, where the growing season for peppers is much longer. His peppers are still being roasted there. This is just one of many success stories that define the love in the world for Italian food. 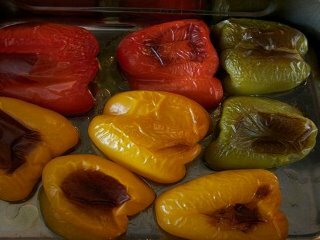 Cut the bell peppers in half lengthwise discarding the seeds and membranes. Place the pepper halves, skin side up, on a work surface and flatten them using your hand. Grill, skin side down for 15 minutes or until the skins blacken. Place in a plastic bag and seal, allowing them to stand for up to 10 minutes. Gently remove the blackened skins and cut the pepper into long, thin strips. Arrange the peppers on a serving dish and drizzle with the olive oil and lemon. Sprinkle over the basil, parsley, garlic and salt. Serve as an antipasto with some fresh bread.